Kelli McGroarty played through pain and scored four goals to lead Eastern to a 5-1 win over Cherokee on Friday. After Kelli McGroarty collided heads with a Cherokee defender on a corner kick, she noticed that blood dripped on the turf from her head. But that didn't stop the junior attacker from making an impact against the Chiefs. 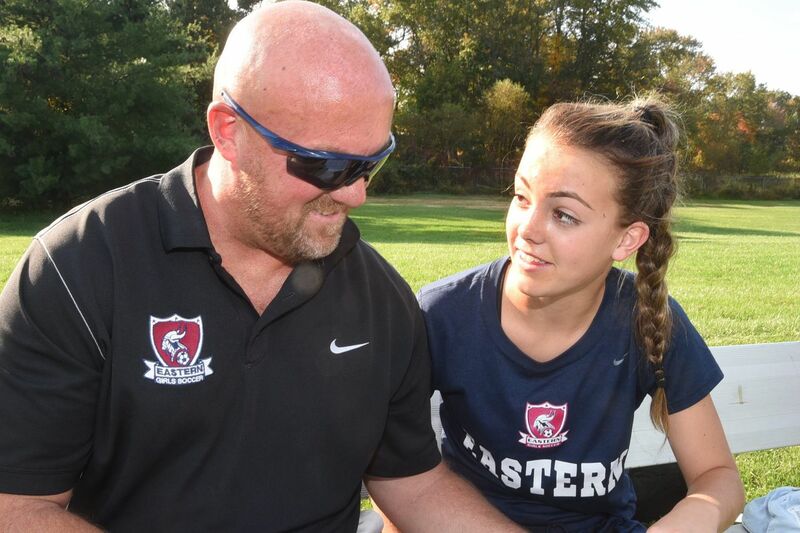 McGroarty returned to the action after she got patched up from a trainer to score two goals to help Eastern's girls' soccer team beat Cherokee, 5-1, on Friday. McGroarty finished the game with four goals after she struck the net twice before the injury. She later got eight stitches on the wound above her left eye at a hospital in Voorhees, Nj. "I wouldn't have came out if I wasn't forced to by the rules," McGroarty said. "I don't like to come out. Pain is just a temporary thing, so you gotta play through it." Millville exploded for six goals in the first half to beat Bridgeton, 6-0. Olivia Giordano and Aaniyah Street scored two goals apiece. Highland beat Hammonton, 5-1. Angelique Mueller scored two goals and Gabby Dean recorded one goal and three assists. Brianna Dupree had eight saves. Samantha Tiedman had 12 saves and recorded a shut out as Clayton beat Pennsville, 1-0. Gianna Ligameri scored. Nina Verdecchio recorded a hat trick in Penns Grove's 8-1 victory over Paulsboro. Linnaya Owens added two goals. Maria Pensabene had one goal and one assist in Pitman's 4-0 win against Glassboro. Angelina Bluford and Juliana Villari and Maria Pensabene added goals. Gabby Breen and Ezperanza Lopez scored as Camden County Tech defeated Lindenwold, 2-0. Julia Carducci scored in Palmyra's 1-0 victory over Florence. Luca Mingrino's goal in triple overtime lifted West Deptford past Ocean City, 1-0. Thomas Dawson, Robert Gardner, Maximo Gutierrez and Michael Torres scored in Hammonton's 4-0 win over Highland. Melvin Casco-Quintina and Brayan Irias each recorded a hat trick as Pleasantville blanked St. Joseph, 12-0. Glassboro defeated Pitman, 4-0. Cody Beato, Colin Bridges, Gorkem Ozdemir and Justin Tongue each scored. Salem edged out Gloucester, 3-2, in double overtime. Jeremy Beal, Andrew Datz and Elijah Miller scored one goal apiece. Hunter Martinez's two goals helped Riverside beat Medford Tech, 6-0. Dylan Andre, Kevin Oram, Ronald Silva and Alex Stockton added goals. Tyler Weiss, Kevin Donahue and Jack McEvoy scored in Clearview's 5-1 victory over Cumberland. Christian Herdt and Cam Giovachinni each scored one goal and two assists in North Burlington's 7-1 win against Pemberton. Woodstown beat Wildwood, 3-0, thanks to goals from Trevor Lodge and Antonio Saughelli. Alyssa Maggs and Brianna Snowden scored in Rancocas Valley's 3-0 win over Pennsauken. Madison Guyer erupted for five goals as Eastern blanked Lenape, 10-0. Linsey Champa, Kara Heck, Amanda Middleman, Tara Somers and Kylie Zielinski scored one goal apiece. Cienna Torre and Adrianna Jones scored as Sterling defeated Overbrook, 2-1. Olivia Sims had assists on both goals. Abbie Brown and Morgan Klaiss each scored a pair of goals in Kingsway's 5-1 win over Washington Township. Clearview rolled past Cumberland, 8-0, thanks to Gigi McAlpin's hat trick. Samantha Johnson, Cara McGuire, Ali Palumbo, Olivia Sindoni and Grace Trovato scored one goal apiece. Shelby Higinbotham scored two goals as Woodstown beat Gloucester Catholic, 3-1. Megan Erdman recorded two goals and one assist as Holy Spirit defeated Woodbury, 6-1. Emma Watson also scored two goals. North Burlington dominated Paulsboro, 7-0. Kalie McHugh recorded a hat trick and Megan Berg, Katherine Dieker, Haley Hentnik and Jordan Jackson scored goals. Bella Marino scored in Bordentown's 1-0 victory against Pemberton. Jenn Ryan had six saves. Lauren Cates scored a pair of goals in Moorestown Friends' 4-0 win over Pennington. Kim King recorded a hat trick as Gloucester defeated Pitman, 5-0. Nadia Deetz and Grace Fetton added goals.